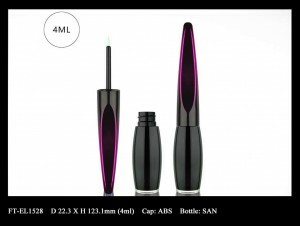 Eyeliner Pack Decorated in Color Gradation – Cosmetics Packaging Supplier | Fancy & Trend Enterprise Co., Ltd. Fancy & Trend introduces gradation decoration for its eyeliner pack. The packaging closure is injection in black ABS plastic, then added a thin layer of color coat on the top of the component surface. The eyeliner packaging features a transparent SAN bottle. It glows with the think-walled component and reveals product colors inside out. The packaging comes with a super fine eyeliner sponge tip that is made to define precise eyeliner. The closure with long bar enables users to enjoy the makeup experience with steady and effortlessly process. FT-EL1526 has a rigged bottle shape of 4 ml capacity. FT-EL1527 has thick-walled bottle design of 4 ml capacity. FT-EL1528 features a raised base on the bottom of bottle with 4 ml capacity. FT-EL1529 has a thick-walled and heavy-based bottle design that is of 3 ml capacity.